The Jackie Gleason variety show was a big part of my family’s Saturday night ritual in the 1960s. Dad would make a Chef-Boy-Ardee pizza, with ice cream sundaes to follow, and we were allowed to sit in front of the TV and watch the Jackie Gleason Show. I remember the overhead camera kaleidoscope shots of the June Taylor dancers, and the Honeymooner segments with Jackie Gleason, Art Carney, Shelia MacRae and Jane Kean. The Jackie Gleason show was a memorable part of 1960s pop culture. Jackie’s signature phrases “And away we go,” “Bam, right in the kisser!” and “To the moon, Alice!” were all part of his defining role as Ralph Kramden, the irascible, demanding bully and overworked, unappreciated New York city bus driver. This piece, depicting an image of Jackie as Ralph, raising his hand in frustration, berating Alice, exhibits that famous phrase showing Alice actually going to the moon – spinning out of their world into space. Michael Miller’s 1950s retro fabric was a great find to perfectly represent the picture-perfect 1950s wife, Alice. The images are fused, then machine appliqued. 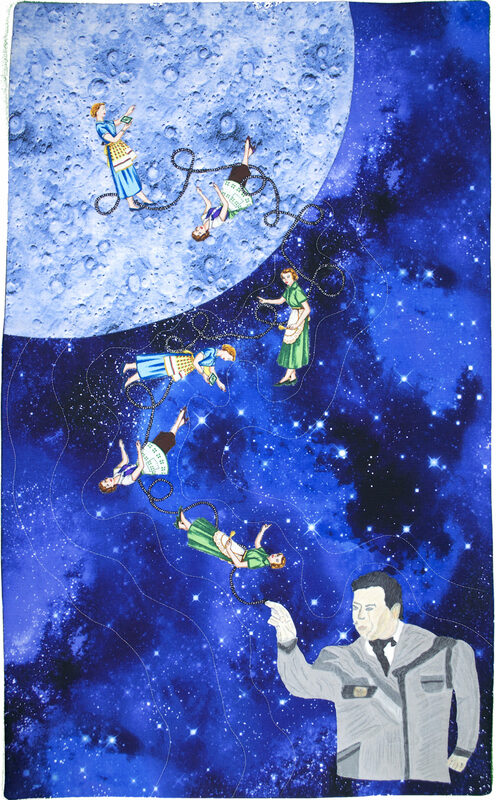 The image of Jackie Gleason was pieced with solid fabrics, then enhanced with colored-pencil shading and an overlay of organza to make Jackie appear ‘fuzzy’ and far away. The black and silver rope looping to the moon with Alice spinning her way into outer space attempts to convey the idea of Alice mindlessly spinning out of control while being tethered to her very defined 1950s housewife role. Fused applique, machine applique, machine quilting. Cotton quilting fabric, organza, cording, fusible materials, colored pencils, metallic quilting thread.